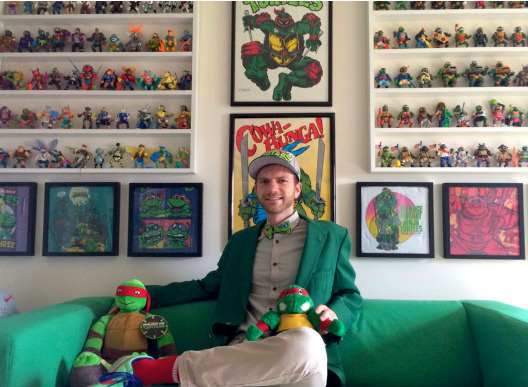 I've got this rad room filled with TMNT treasures called The Sewer Den. A museum of memories, a collection of cowabunga. From the 80s until now, I've always loved the Turtles. Halloween, Christmas, even my wardrobe - everything somehow involved those lean, green fighting machines. For more, check out my very own origin story. The Sewer Den mutated into existence back in 2011. Since its launch, the nostalgia-based blog has become a pizza-powered phenomenon (and has been featured on multiple media outlets). When not fighting the Foot Clan, I'm flexing my creative muscle in television, film, agency, and internet. Although I work primarily as a Producer/Editor, I have significant credits in writing and directing as well. Oh yeah, and I made a movie too! I'm really loving your website! Is there a post of your entire tmnt figure collection anywhere? Coming soon! The entire room, the entire collection, will soon be displayed on the site. Keep you posted!